Drove down from NY to enjoy the peace and quiet of the mountains. This lovely cabin and beautiful surroundings was perfect. My husband and I walked many trails with waterfall views at everyone. The highlight we driving the "Tail of the Dragon" in our Miata. Definitely a get away to remember. Went on the GSMR trip. It was a great ride. Went to Fontana Dam. Largest damn east of the Rocky Mountains. We enjoyed this beautiful cabin, the hot tub, and the stars and the dancing fog. Thank you for sharing your beautiful cabin. We came to celebrate our 42nd anniversary. The cabin is beautiful and secluded. It is just what we had hoped for. We enjoyed exploring Bryson Cit and driving 28 north to Fontana Village and lake. We had a great stay here at The Scratching Post. Fun was had by all. The cabin is great, clean and we had everything that we needed. We enjoyed biking, white water rafting, paddle boarding and boating. Great Trip!!! We had a wonderful time in this cabin. Everything was clean and beautiful. We will recommend in the future. Nice territorial view of the smoky mountains from the upper deck and loft. Cabin was clean and ready when we arrived. Linens and such were nice quality. The hot tub was setup and usable. They put together a very nice binder full of information ranging from local food, activities, Town map, cabin info, etc. This was nice for fine tuning plans. There is dish tv which was nice for the kids to wind down with. There is internet, but it seemed to work somewhat intermittently -- we used the info binder to bridge the gap. There is good cell as you get down the mountain. Close proximity to Bryson's city was great. The roads are definitely mountain and turn to gravel at the top stretch - we had no trouble in a Tahoe. It provided a great base for our group as we adventured through the Great Smoky Mountains. The Native Winds cabin was a great place to stay. My husband and I thought it was perfect for just us 2. It was located in a remote place that was close enough to the activities in the neighboring towns. Kathy was very friendly & helpful getting our reservation completed. Kathy also called day of check-in to make sure we were happy. She was a pleasure to work with! We absolutely love the Cabin. What a wonderful view. The cabin was also well stocked and we had a great time playing games and spending time as a family. 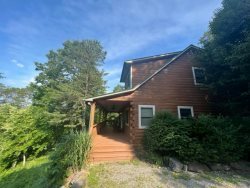 Stayed at this cabin in June 17, was absolutely wonderful weather actually a little cool for June but the cabin was just beautiful, well maintained everything needed to relax, all dishes and kitchen wares. Very Quite, nice view of the valley. We really enjoyed your cabin!!! Beautiful inside and out. The people are amazing!! Very friendly and helpful throughout your booking process and stay. Love to deal with people like that!! Location was beautiful. My husband taught our daughter and son-n-law how to fish. We loved the cabin and everything about it. We loved the fire pit and the porch. We look forward to coming back.